The blog of Kitchen Design Academy Online that brings you information, news and thoughts from the school and around the world! "Beyond styles, colours, and materials, there are other important factors that contribute to creating a great kitchen. You may read or hear comments like ‘well-balanced kitchen’ or ‘harmonious play between colours and textures.’ The key aspect in these comments is harmony. In art, architecture, design, harmony is “the combination or adaptation of parts, elements, or related things so as to form a consistent and orderly whole. It can also be described as a combination of parts or details with each other so as to produce an aesthetically pleasing effect “(Arcy Art Original Oil Paintings Art Dictionary, n.d.). In the above-mentioned definition, harmony is described as the combination of the elements into a consistent and orderly whole. In the case of kitchen design, which are the elements we are dealing with?" Designer, entrepreneur, visionary. Three definitions that make apt Gabriele Centazzo one of the undisputed guru of the kitchen that can boast, through the history of his company, "thirty years of sustainability" and a series of innovative solutions have fundamentally altered the ergonomics and the structure of the contemporary kitchen . 's mission of sustainability has resulted in the full respect of the fundamental principles of eco-compatibility - dematerialize, recycle, reduce toxic emissions, ensure long product life - to the point of proposing the lifetime warranty of the product by the withdrawal of the kitchen used to end of life. But the challenges continue to Gabriele Centazzo. The door of the kitchen program Riciclantica, the maximum expression of a design based on dematerialisation, consists of an extremely resistant structural aluminum frame and a sophisticated panel that is only 2mm thick. The use of special materials such as carbon, aluminum, steel or layered laminate, the very accurate planning of construction details, the interior of the new frame appears aesthetically pure without screws and hole caps, and a 'absolute resistance of all door versions to water, steam, heat, help to make the Riciclantica door unique in the furniture industry. 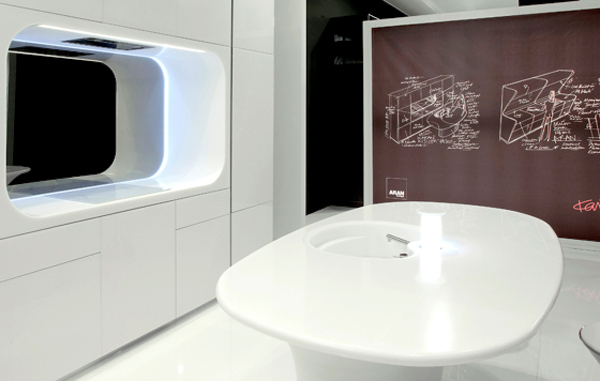 Riciclantica is a kitchen designed to have a low environmental impact and represents the most advanced technology to express the shape of lightness. Thanks to the research and application of special innovative technologies respects the four basic principles of: minimal consumption of raw materials and energy, durability, recyclability, non-toxic finishes. Artematica Vitrum Arte | Artedeisa - "Cow Chic"
With Artematica Vitrum Arte Valcucine has developed a special technique to create various designs on glass inlay: a highly technological process, which has its roots in the tradition of craftsmanship. Designs are cut on a special colored film and manually applied on the panels in tempered glass Valcucine that will make up the doors, the floors and sides of the kitchens. Decorate performed with patience and passion to make unique and inimitable every single composition. Upon matching the colors of the floor plans Smeg Valcucine are: cement matt, matt and hemp matt black chalkboard. Riciclantica evolves. So its doors. Thanks to the innovative process, the surface of the leaf is able to transmit to the eye and to the touch feeling of organic deformation: new shapes and volumes inspired by nature that make the leaf Riciclantica alive, as if the pulsating life in matter. Suffice it to say 100% aluminum wing without screws: a device that translates into total recyclability and ultimate expression of the concept of dematerialization, even avoiding disassembly, A door at absolutely low environmental impact and preservation of heritage trees (85% reduction of material compared to a traditional door) thanks to the use of an aesthetic wooden panel, only 2 mm thick. High technology, formal simplicity, pure and essential lines are the main features of one of the most modern kitchens in the world, even in the new version of Artematica curve. Artematica curve is characterized by a sinuous line that runs seamlessly throughout the kitchen creating a game of concavity and convexity which promotes an ergonomic use of the environment. As with all programs Valcucine. Artematica curve can combine with all the product lines with the same Artematica Valcucine and giving the designer a freedom of design is unique in the world. As in the original version version curve Artematica is constituted by a structural aluminum frame to which are applied to various types of panels of different materials: lacquered MDF, glass, steel. This system facilitates a reduction in weight resulting in longer life of the hinges, locking in a quieter, easier recyclability, reduced environmental impact. Design Gabriele Centazzo with some customizations Alessandro Mendini. 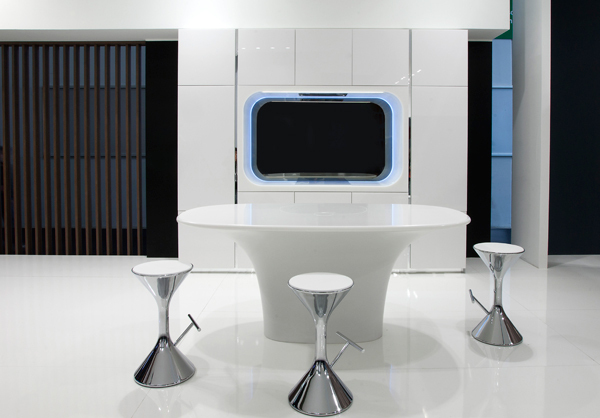 No, this isn’t the cockpit of the Starship Enterprise, but it is a space-age looking, futuristic vision of the modern kitchen that utilizes the extraordinary properties of HI-MACS acrylic stone. The smooth, 100% non-porous surface is ideal for use in the kitchen. Easy to clean, hygienic and extremely resistant to heat and chemicals, it’s especially suitable for food handling. Kook Kitchen – The exclusive concept of this kitchen is distinguished by sinuous silhouettes and an entirely innovative ergonomic design, which was made possible due to the unique properties of HI-MACS which proved essential to facilitate the shape and functional requirements of the fab kitchen. The worktop used in the Kook model, which is more than 90 cm deep, allows an improved layout of the hob and sink zones, as well as making it more user-friendly. 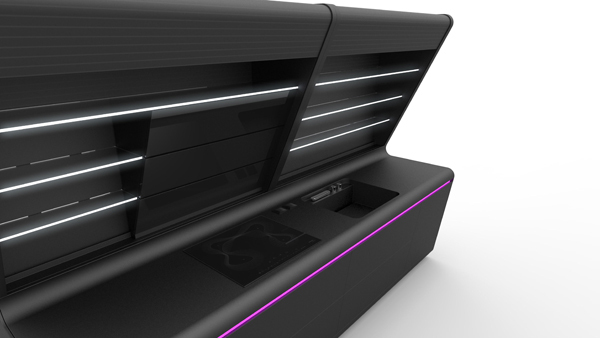 The starring role of the ambitious project by Karim Rashid, aside from the latest-generation acrylic stone, is light, with LEDs arranged underneath the worktop, which highlight the magenta coloured aluminium groove. There are also LEDs inside the wall unit which illuminate the edge of the glass, giving the kitchen a dramatic appearance. Karan Kitchen – The concept of Karan on the other hand, is based on an island, with a tapered silhouette, which encourages conviviality. When not in use, the mixer tap and LED light withdraw into the worktop. The simple addition of a multi-purpose chopping board which fits over the sink creates a handy dining area. Soft curves continue on the kitchen’s wall-mounted unit. An opening with rounded edges provides a space for cooking and food preparation within the unit. Owing to the excellent thermoformability properties of HI-MACS®, which make it possible to form the material into an infinite range of shapes, and realise any designer’s dream. 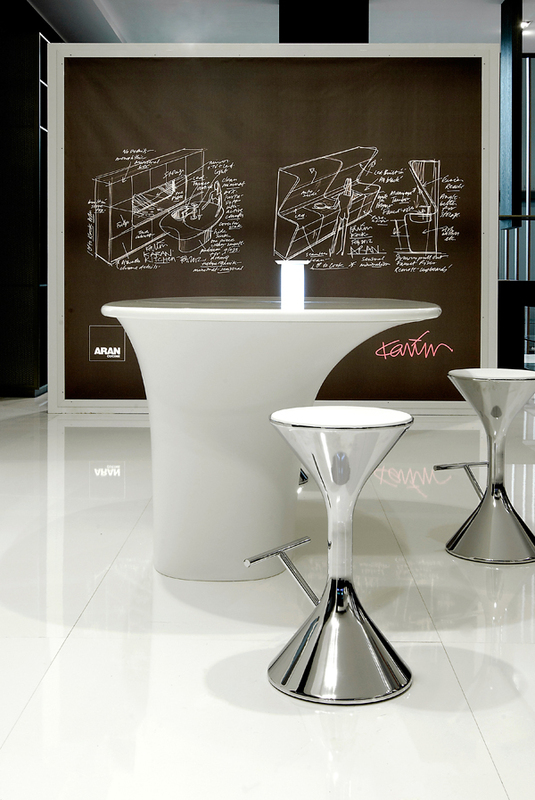 Aran Cucine was able to produce, thanks to Karim Rashid’s visionary idea, two exclusive concepts featuring a soft and fluid design, of extraordinary beauty, whilst still adhering to hygiene and production issues. The owners of this new kitchen have a passion for American architecture that is reflected in their decision to choose a custom-designed Hamptons-style kitchen from Wonderful Kitchens. The dining table is an integral part of the island; it features fluted column legs with Federation blocks at the base. Think of the Hamptons on Long Island and it's easy to conjure up an image of laid-back luxury and summer socialising. It's an image that's also associated with a particular look – one re-created in this new kitchen designed and manufactured by Wonderful Kitchens. Designer Fred Tabet says the clients have a strong passion for American architecture, and have designed and furnished the rest of the interior to evoke the same feel. The kitchen not only brings together all the elements that capture the unique Hamptons look, but also teams these with all the functionality required by a busy family that loves to entertain. The white cabinetry is detailed, without being over the top – there are glass display cabinets and decorative mouldings, including corbels, dentil crowns and fluted columns with Federation blocks. Wonderful Kitchens says much of its new business comes from word of mouth, and from clients who appreciate the friendly, professional service from a company that has a proven track record. 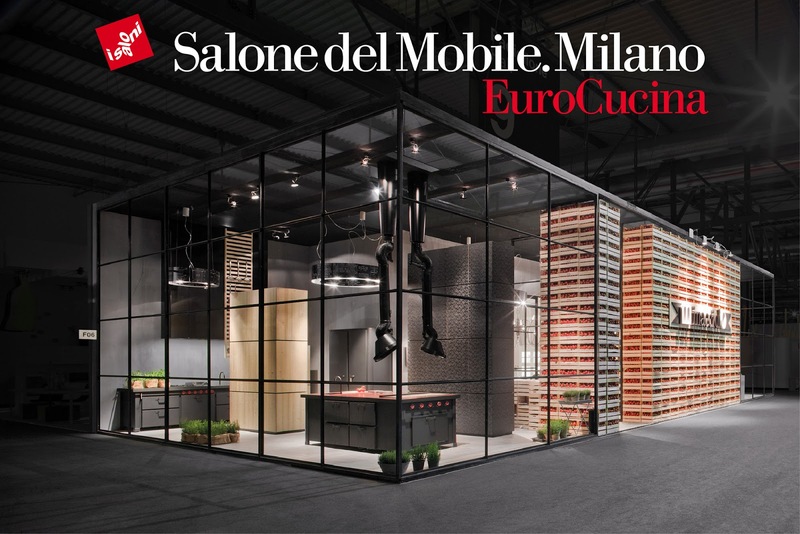 Minacciolo reconfirms its presence this year again at EuroCucina, held every two years at the ‘Salone Internazionale del Mobile’ in Milan. In occasion of this exhibition Minacciolo will celebrate its 40th Anniversary. CODE EVOLUTION by Snaidero stands out as a kitchen with a vintage twist, decidedly industrial, with clear references to the Nordic style. This model has a strong impact due to the choice of materials, such as cement and Peltrox stainless steel, and the combination of elements with exposed screws, handles and accessory-holding bars. I have the privilege to be born in a historical place with rich tradition in craft and arts: Transylvania. Most of material published in this blog is copyright.Please e-mail me before your share it... Awesome Inc. theme. Powered by Blogger.